To read a letter from our founder and executive director, Tracy Della Vecchia, about the various stages of your Marine's career, please click here. Whether you're brand new to life with a loved one in the Corps or you're an old hat, we strive to provide the most relevant, up-to-date information to help you know what to expect as your Marine navigates his or her career in the Marine Corps. Below you'll find information on each of our outreach services for each stage of the Marine Corps career and how we support you and your Marine. Our staff and volunteers look forward to knowing you and taking this journey with you! A poolee is an individual who has already signed up to become a Marine but has not yet left for the 13 weeks of recruit training at boot camp in San Diego or Parris Island. Each spring, Marine Corps recruiting stations around the United States hold a "Poolee Night" to bring poolees and their parents together to learn what to expect in, and how to prepare for, boot camp. The poolee and parent event is important for soon-to-be recruits, as they will receive useful information. Its just as important for the parents, many of whom may be nervous and unsure of what to expect during their Marine's career in the Corps. 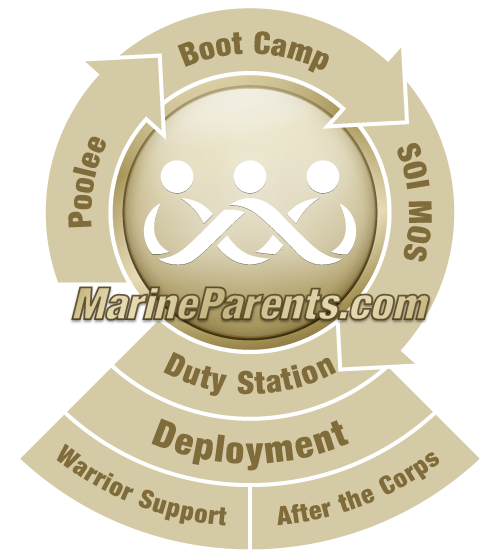 Poolee Nights also provide an opportunity to bring in parents of recent boot camp graduates and parents whose sons and daughters are currently in boot camp so they can lend support and share information with poolee parents. All graduates of Marine Corps recruit training attend the School of Infantry (SOI). Marines who graduate from recruit training at MCRD San Diego will attend SOI–West. Marines who graduate from recruit training at MCRD Parris Island will attend SOI–East. At SOI, they will train with one of two training battalions, either MCT or ITB. All non-infantry Marines attend training at Marine Combat Training Battalion (MCT), while infantry Marines (all Marines with a Military Occupational Specialty (MOS) of 03xx) attend training at Infantry Training Battalion (ITB). We also provide Unit Information Pages™, or UIPs. The UIPs are a searchable database exclusively from MarineParents.com, Inc. By searching the database for your Marine's PDS, you'll find a page full of helpful information, links, message boards, Family Readines Officer names, and phone numbers. The emotional roller coaster of your Marine's deployment may be more than tough—it may seem almost impossible to tolerate. You'll likely experience some combination of pride, fear, pride, anxiety, pride, worry, and more pride. The uncertainty of what is to come brings emotions and feelings that none of us thought would be part of our lives. But you are not alone. Thousands of other parents have the same emotions, and Marine Parents is "a Place to Connect & Share®" with those who are in your shoes and understand your emotions. MarineParents.com, Inc.® believes that the highest obligation and privilege of citizenship is that of ensuring that the brave men and women who have borne arms for our country are cared for and supported in an adequate manner upon their return to America and reintegration into civilian society. With that in mind, our Warrior Support Team™ strives to provide resources, peer mentoring, and fellowship to wounded, ill, and injured troops and veterans, including those living with post-traumatic stress, as well as provide resources and support to caregivers and family members. After the Corps provides support, information, and services to post-9/11 Marines and their family members during transition into IRR, reintegration upon discharge, and as veterans.